This week's challenge #49 is animals....I searched though my sets looking for an animal to use - the card I created uses the Noble Deer set along with the Aged Parchment technique from the June TJNL. Here's a card I found in my files - that also fits today's animal challenge so I thought I would share it. I used the Colorwash Technique on my background panel, then embossed my image. I added color using my watercolor crayons. The rooster image is from Lasting Impressions with Panache. Both cards are terrific! I love the green Afternoon Tea paper for the background on the deer card! What a great choice of paper to use! Wow, these are splendid, Lisa. I especially like how the Afternoon Tea looks with the canvas (or which ever one you used) on top. Fabulous job on both cards. Can't wait to get my New TJ Newletter! Love the deer card the best, Lisa - that paper was a wonderful choice. I LOVE the deer card and the technique is just perfect for it! Lisa, you are the Queen of backgrounds--all of them look so good! Great cards! Both of these are gorgeous! TFS! Great cards. I've always loved that deer image. I enjoy seeing deer in the wild like that. 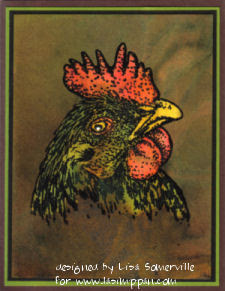 Love the bright colors on your rooster card. cluck cluck...can you guess which one I like bestest! Both great! Beautiful! I really like the look of the Aged Parchment--I'm looking forward to getting my newsletter and checking it out. Both of these cards are so rich looking. Nicely done Lisa! I love that deer. Every year I think he is going to retire so I don't buy him! If he is still around this catalog I think he will be my fist order, lol. You always succeed at pushing me over the edge. Great card. That tech is perfect for that deer! Love the layered look of the background...such depth! Both cards are wonderful, Lisa...I haven't tried the aged parchment yet...on my list to do! It looks great with that set! Great cards, Lisa! I'm always so impressed that you do all the cool techniques that I just read about! An inspiration for sure! 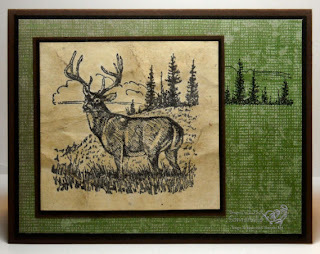 I like the deer card as well, especially the way you stamped the trees in the background outside the layer. What a GREAT idea. I will have to remember that some time. Beautiful card, love the colors you used on it!